Although I've been painting miniatures for a couple or three years now, a sensation akin to ice water running through my veins occurs every time someone asks, "what rules are you basing them for?" or "when are we going to see a battle report?" The truth of the matter is that I just didn't know where to start or how to go about organising a game. Now, however, with my immersion into the madcap world of 'Crooked Dice's' 7ombieTV a playing surface is required and what better opportunity does a chap need to fashion his very first gaming board? I could of course just thrown a green baize over the dinning room table, but I've always rather fancied one of those stunning looking tables that grace the pages of such hobby related editorials like 'Wargames Illustrated' the only problem is scale, 'Awdry Towers' isn't as expansive enough to cope with a 6' x 4' playing area and I'm simply not brave enough to suggest to the Saintly Mrs. Awdry that we have our supper on our lap in order to allow me to reenact the battle for 'Rorke's Drift'! "Stop chucking that bloody cutlery at me!" It was while avidly following Clint's ('Anything but a One') progress on his very own gaming board project, that I suddenly realised size isn't everything! He was constructing a fabulously detailed terrain board on a modest 2' x 2' - this, I thought was the answer, compact and bijou! And so it was that my bespoke board started life as a couple of sheets of blue foam (James, from 'Exiles Wargames Painter' has found a superb source for this most useful building material here.) glued to some 5mm foam board; lightweight but structural sound. The rest should have been a simply process of just terraforming, but 'oh no', I decided that I wanted my board to be timber framed, enabling me to drop in any future boards that I might fashion and allowing variation to my miniature gaming scenarios. Now when did the wife say she was back? After what felt like a couple of hours scurrying around in the blistering heat of the loft, I came across some suitable looking off-cuts, of what was once one of IKEA's finest, and set about them with every tool I possess; so much for measure twice and cut once! 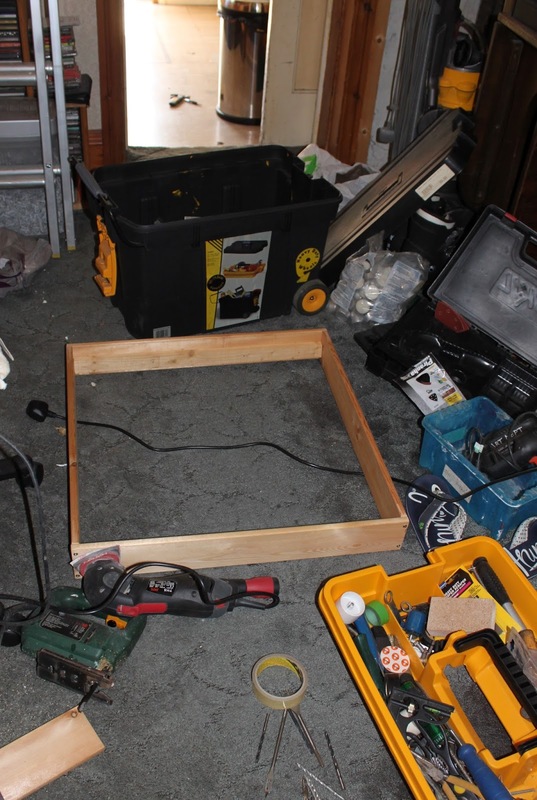 With much sweating, snarling and a modicum of bad language I managed to piece together the frame, complete with internal side runners to allow the board to fit flush with the surface - it is fair to say that at this point I was feeling a tad smug! With the frame safely constructed and the rough edges sanded down (I knew that detail sander would be useful for something!) I was able to get back to the job of preparing the board. The scenario that I'm looking to game is essentially a flat area with some light woods and the bank of a lake. Once sketched out and the '4Ground' wood bases placed foe effect, it was just a matter of hacking away with the bread knife. The lake bank established, I added some sand to texture the paths and some small stones here and there to add a little variety. Household filler helped to fix the wood templates in place and a light covering of some textured masonry* paint helped to seal everything together nicely. *leftover from my recent bout of D.I.Y. fever which has fortunately subsided without any lasting damage! All that remained was to 'Paint it Black' in preparation for some colour that I hope, if not distracted by the cricket, to apply over the weekend. 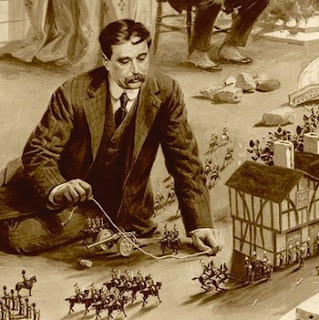 First illustration from Illustrated London News 1913, showing Wells measuring a move with string. It's grand to see you making a gaming board! I thought that this group of figures might prompt you to do something like this. Finish it up and begin doing AAR'S! Thank you Anne, just felt it was about time to take the hobby to the next step, so to speak. Great start. I, for one, believe thete is great fun to be had on the old 2x2. Of course, I'm playing 15mm so that's part of it. The Bunker Job post on my blog has the board I'm most proud of. Dry river bed and rocky outcroppings. Thank you, love some of your terrain work, especially the latest board - very smart. If theres anybody who can make an awesome playing field...that would be you. Not a doubt in my mind...it would be first class. That is incredibly kind of you, I shall endeavour to live up to your expectations Captain. Sweet! I love the timber frame idea. You'll have a playing surface that's the equal of your figures when you're done. If only I could make a straight cut with wood. Thank you Monty, I have to confess that there is not a lot of straight lines on my timber either! Looking good Sir M, can't wait to see the finished product! Obviously a way to go, but pleased so far. Thats a mighty fine start you have made there Mr Awdry, If I can be so bold as to advise you to check the tree bases still fit in the holes, after you have textured and painted, experience has taught me the slightest bit of grit etc can cause a problem. Oh b****r you are not wrong Andrew, might need to tidy those up, thanks for the heads up! I wish I'd thought to check that before, oh well, I'll know for next time and thank you. Looks like you're on a good way sir! I'll follow this one with keen interest. Firstly thank you very much for the mention I really appreciate it. Most importantly WOW it is looking fantastic. What a terrific start, I can't fault it. The joy of small boards is not only storage, but also focus. Most Crooked Dice Boards are now 2' square (yes they do have a couple of larger ones as well). Which gets you into the action with no mucking about. I won't wish you luck I really don't think you'll need it. And knowing your attention to detail it will come out top notch. Thank you Clint and you are more than welcome, it was most definitely you post that got me thinking that I could do this too. Good to see a board in progress, and now we'll be able to look forward to some battlereports involving your beautiful figures! Thank you Scott, battle reports are definitely on the 'to do' list! I´ll second Andrews Suggestion about checking the holes, it´s a swine when bits of whatever stop the sabots going into thier plug holes..and like Monty..I cant cut a straight bit of Wood to save my life. I know how, I´ve even got all the kit but it just doesn´t work out. It´s looking good, only one question. What if the playing area isn´t sufficient? Would it be possible to add sections seing as it´s got a Frame? Thank you Paul and so much good advice has proved to be invaluable already. As for the playing area, the idea is that I could fashion additional boards that could but up to the existing one, but the frame would be redundant for those; it just adds a nice finish to my 'coffee table' games. Terrain making is always good fun Michael. None of that squinting while painting to see if you've got that tiny button spot on, no eyes to paint, just bish-bash-bosh, slap it all over. I couldn't agree more Tamsin and thank you. "Is their no end to your talents?" said Mr Green. Looking good there Mr Awdry! A simple matter of terraforming? I say sir one makesit sound so easy. Compared to the woodwork it felt it - I just never seem to get the timber to behave as I want it! Very nice start! looks like it'll be a high quality board! Thank you, hoping that it will be of a standard, but happy just to get going on it. Thank you Juan, more to come soon. Great work there Sir. Looking forward to seeing the next instalment!! Thank you Rodger, on its way. Great progress on your first board. I say there Michael I rather like he table and a cracking idea to do 2 by 2 as 7Tv games work well on the small scale. I cant wait to see this develop further. Thank you Pete, I was just desperate to get something started and seeing Clint's really got me inspires to have a go myself. You are off to a grand start! I'm looking forward to seeing how it turns out! Thank you Cory, looking forward to the next stage myself. Thank you Dean, perhaps a bit showy, but as I couldn't have the scale I though, "why not?" Will be following this intently - looks fantastic. that's a good tutorial and a promising start. I'm looking forward to the next steps! Thank you Stefan, more to follow soon. It looks like you are off to a good start here. There's a chance you're qualified for a complimentary $350 Ikea Gift Card.